Day 07: Rest day in Mumbai. First 'No Ride' day. Day 09: Rest day at Udaipur. Second 'No Ride' day. Madras felt so distant even after heading few hundred kilometres south post Kolkata! You should design your motorcycling itinerary according to own your riding preferences and touring priorities. There's no point in blindly following another motorcyclist's algorithm. If you're new to this neighbourhood you can always reach out to seasoned road travellers (preferably riders) for wise counsel. Apply their inputs in sketching your personalised ride plan instead of copying them. Remember, at the end of the day nothing beats your own research applying Google-maps, Wikis, Trip Advisor reviews and discussions in various online travel forums. I've seen many travellers are confused whether to plan their Golden Quadrilateral road trip clockwise or anticlockwise. I did it clockwise, i.e. 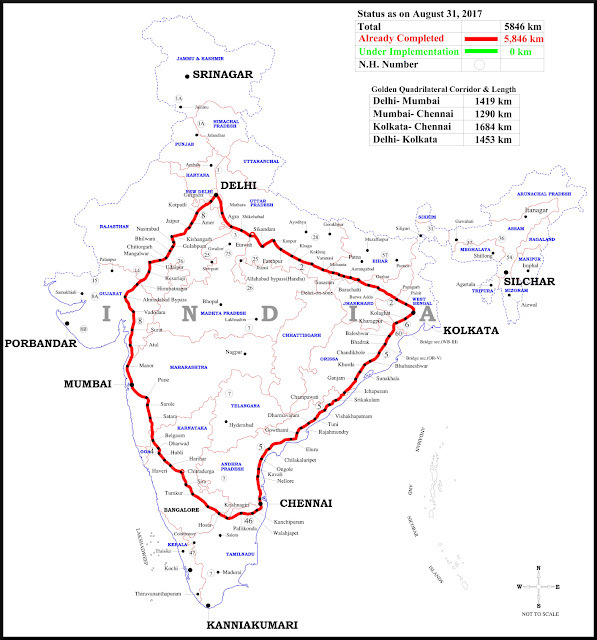 Kolkata- Chennai- Mumbai- Delhi- Kolkata. I was quite aware of the unreliable state of NH-19 (more popularly known by its old name NH-2, or Delhi-Kolkata Road). So, I wanted to include this unpleasant segment of GQ in the final quarter of my ride plan. For me this was a smart move because my hometown lies at the southern extremity of NH-2. But, if you start your drive from the southern or western segment of GQ circuit, then you may simply toss a coin to break the dilemma. If you need any assistance in planning your Golden Quadrilateral ride itinerary you're most welcome to bother me. We're done for today. Next, I'll be briefing you the synopsis, experience, Bombay day, Udaipur day, may be a dedicated post on Taj Mahal, and of course the crash day. I'll see you soon. 6,261 kilometres! Quite a difficult task.